The Christmas holiday season is over and all the goodies are gone, including the 3 batches of Chex mix I made. So it’s time to say goodbye to the empty cereal boxes. Some went the way of the recycling bin and others… well, they went the way of my craft room. I cut a box into tag shaped pieces. Then I covered one side with printed paper and the other side with plain white card stock. I layered on pieces of different papers and sandwiched trims, pieces of paper doilies and snippets of tulle between the layers. Here are the finished tags. I didn’t buy anything for this project. I only used supplies from my stash. I think they turned out pretty well considering they started as waste. I hope this inspires you to look in your recycling bin, pull something out, and use items in your stash to create something pretty and new! Every once in a while I get the urge to make a project just using the junk that is cluttering up on my desk. I decided to make an ATC sized magnet so I could reuse the magnet strip off list pad I had just finished up. I always have varying sizes of cardboard on my desk so that was a no-brainer for the substrate. I opened a new bottle of gesso and an obscene amount poured out onto my little ATC. I was actually able to gesso 2 – 8 x 10 canvas boards, 2 – 5 x 5 stretched canvases, 1 – 6 x 8 canvas board and my ATC with that huge puddle! Next, I painted on some cream and brown acrylic paints to give it a vintage feel. This very blurry picture shows some eggs I cut from some scrapbook paper. I inked the edges with distress ink before decoupaging them onto the card. Here is the “finished ATC”. It’s really simple, but it gives me that old field guide feeling. I painted the back of the card the same color blue I spattered on the eggs and attached the magnet strip from the used up note pad. I like how the ATC magnet came out, but I just needed to add one more touch to make me love it. Yep, you guessed it. I added glitter to the butterfly’s wings. NOW it’s done and I do love it! I hope you like it too and that it inspires you to make your own little work of art with things that are already on your desk! Instead of making cards, however, I was inspired to make some tags using her techniques. First I cut some tag shapes out of cardboard. I just free-handed these. Then I added a layer of texture using decoupage paper, drywall tape and old book pages stuck on with Gesso. For my first tag I used my Prima Princess paper collection and embellishments. For the second tag I used some specialty papers and some papers from the Market Street collection by My Mind’s Eye. For the third tag I used paper from Tim Holtz and My Mind’s Eye, however, I forgot to take a picture of the papers used. Sorry! Here are the three tags I made. I love how they turned out. There is so much layering on each one so the dimension is quite thick. If you find yourself in a rut or just need a little inspiration. Go to Marta’s YouTube channel, Maremi SmallArt. I know you will find some videos to jump-start your art mojo! Thank you Marta for all of your videos, including the “Break a blank page” series! As I was browsing through a JoAnn’s store flyer a couple weeks ago, I saw this cute metal owl lawn stake. I love the corrugated metal look. And I love owls. So, I decided to try make some of my own. As I did not have any corrugated metal just laying around I needed to make some adjustments. 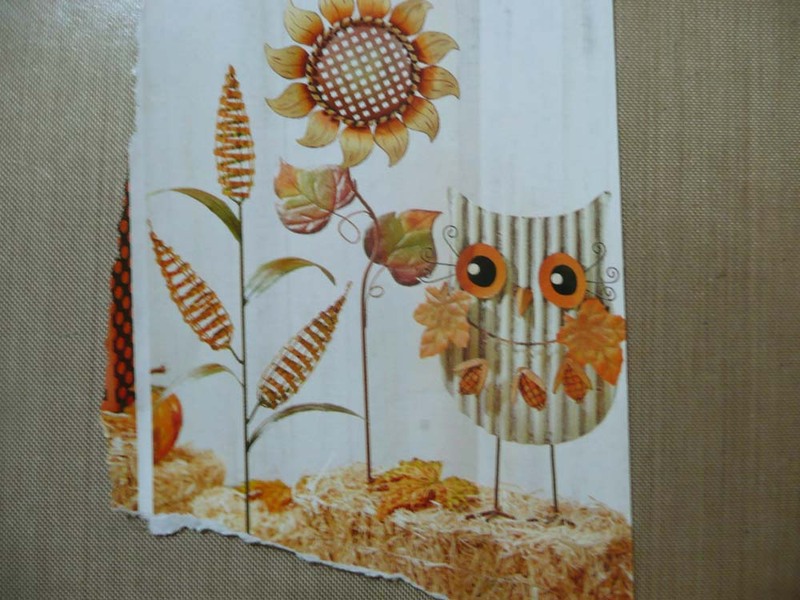 Picture of metal owl yard stake from JoAnn’s sale flyer. 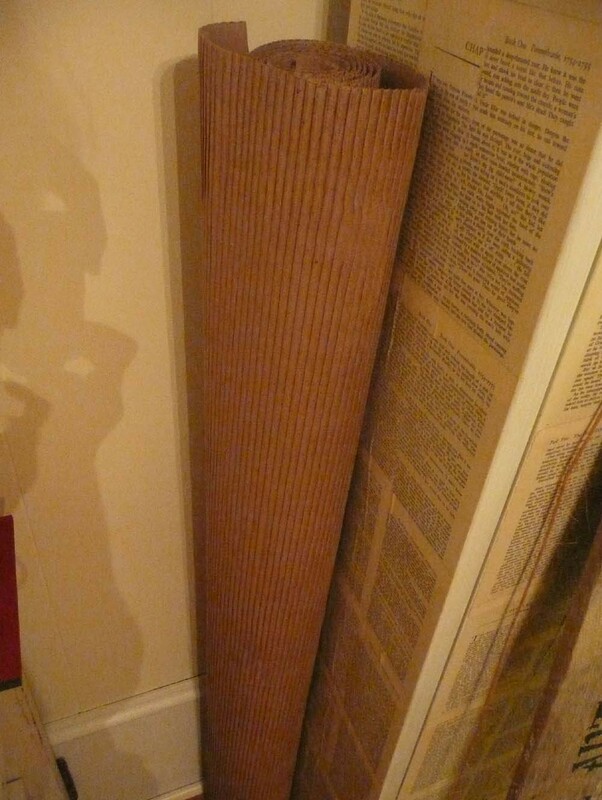 Large roll of corrugated cardboard leftover from home renovation project. Because cardboard can’t logically be used as garden decor, my project got a little smaller. 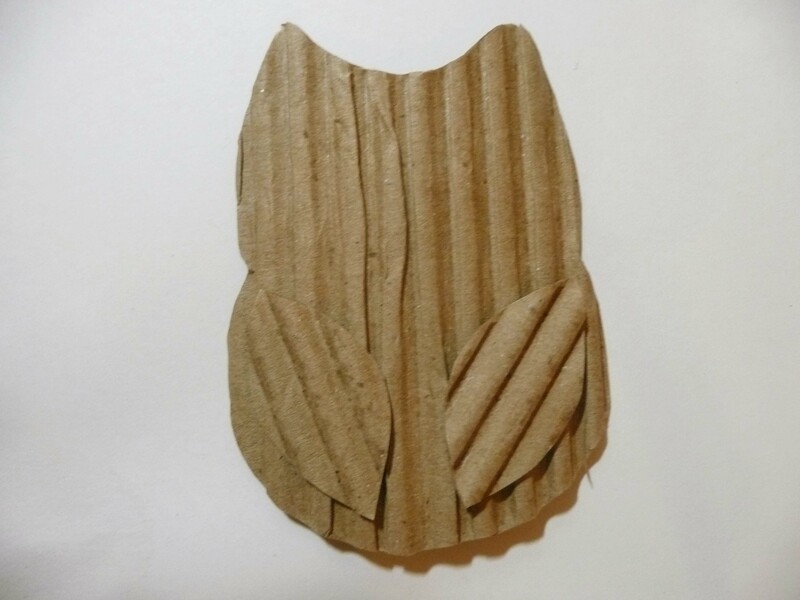 Small cut out owl shape. I loved the way this little guy looked, so I went ahead and finished decorating him and gave him some friends. 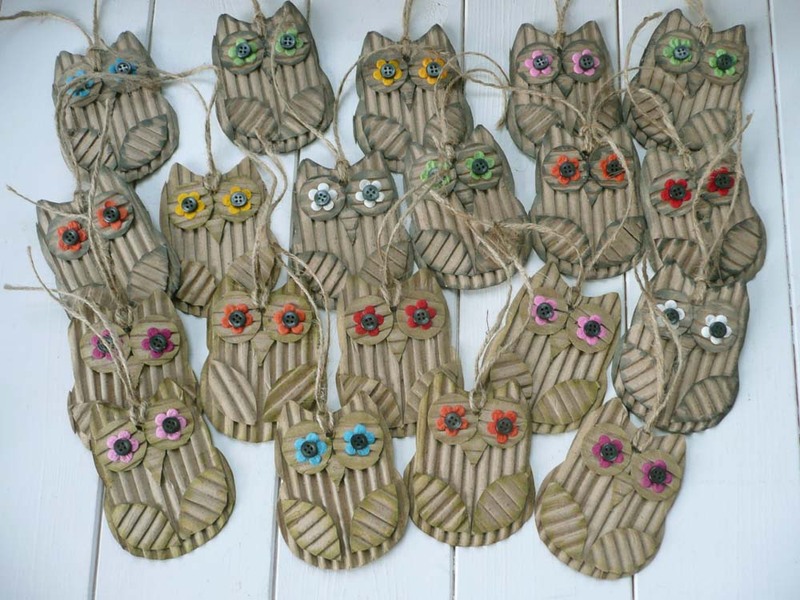 Corrugated cardboard owl hang tags. I made them into little hang tags that could be used on gifts, hung on furniture knobs or even used as bookmarks. Ready to go to the Foxwood Barn Sale in October! 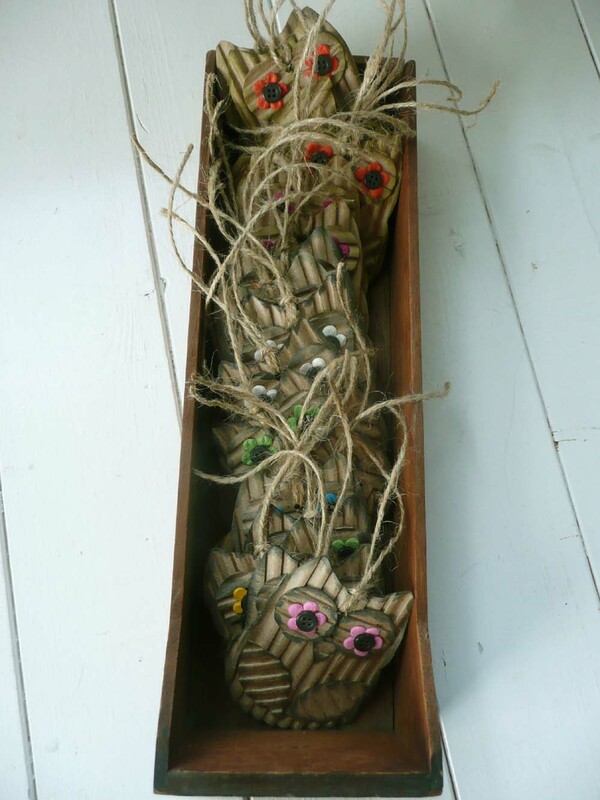 They are all tucked into a little wooden drawer and ready to be taken to an upcoming barn sale! Just for fun my friend Camilla and I decided to do some arts and crafts swaps with each other. Our first swap consisted of mini Christmas albums. You can see my posts from December 12 & 29, 2013 to see those. This time we opted for something a little more fun and relaxed so we decided to exchange junk journals. The rules we had to follow were simple. First, they had to be at least 1″ thick and second, we were not allowed to buy anything new to use in the journals. The idea made us use up stuff we already owned and to collect other junk papers as fillers. It’s amazing how every piece of paper takes on a new life when you are making junk journals. You turn every box, bag, envelope and scrap of paper over and over in your hands wondering how to incorporate it into your journal. I changed my mind a ridiculous amount of times as to the theme for Camilla’s journal. The more I looked at Pinterest and YouTube the more overwhelmed with themes I came. Finally I decided on an “elegant” junk journal. I called it “A Ladies Junque”. I actually made it so thick I think Camilla will have to take some pages out as she adds her stuff! To spare you from having to look at every page, I only photographed a couple random pages. Enjoy! Calendar page and corrugated cardboard. I hope Camilla enjoys this album and has lots of fun filling it up. I will show you the journal she gave me, probably as my next post. If you would like to get yourself a junk journal to fill (here comes the shameless advertisement) I have several in my Etsy shop right now. The address is: http://www.etsy.com/shop/MossyCottage. I also can make themed junk journals on request.